Like a lot of my nerdy Drama Club high school friends I was introduced to “Monty Python,” “The Rocky Horror Picture Show,” and “The Evil Dead” movies at an appropriate age to be properly influenced by them for the rest of my life. With “Evil Dead 2” my first time witnessing the awesomeness that is Bruce Campbell, I became a lifelong fan. 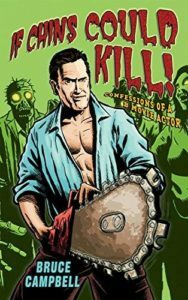 So, when my girlfriend showed up with a copy of “If Chins Could Kill: Confessions of a B Movie Actor,” as a gift I promptly hugged her and started reading it. Okay, maybe not promptly but I did start reading it a few days later. “If Chins Could Kill” is a light-hearted look back at Bruce Campbell’s career where he proudly discusses his rise to the king of B movies beginning with his childhood in Michigan. As a youth, he did what many other boys do, and that is having fun and causing trouble. With Bruce that often involved his brothers. Then in high school, he would meet his often collaborators in filmmaking Sam Raimi, Rob Tapert, and a few other budding filmmakers. It was with this small group of friends that Bruce got his start in what would be a career on film. Together they would make short films with Super-8 cameras learning the craft through doing and having fun while doing it. Most of the book, however, is what most readers like me want, the making of the Evil Dead series of movies. Bruce Campbell goes into great detail about these cult classics. He discusses not just his time as an actor in the films but as a producer and the hardships of finding money. He does this in his typical light-hearted way. It is through a mixture of dialogs with his filmmaking friends, pictures mixed throughout the book, and his personal stories we learn more about the hardships of filmmaking. Mixed with the difficulties in making a movie with no money, he integrates plenty of behind-the-scenes hijinks. What stands out in this book is that he doesn’t idealize the career of an actor. Often we think of acting as fancy award shows. 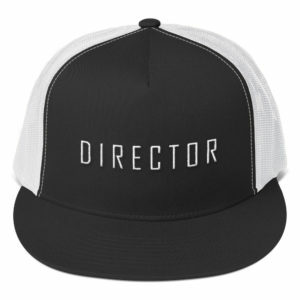 We image actors with their own trailers and production assistants running around attending to their every need. The reality for most actors is, that they spend 10 to 14 hours days or nights freezing, covered in mud, being hanged from the rafters, wearing uncomfortable clothes, having makeup or prosthetics applied and removed, or sweating in costumes. In this book, we get all the glory but mostly the humility that is involved in making a living as an actor. For those of us who dream of B movie stardom, we also get a bit of hope and inspiration.